The beautiful house was built in 2013. Special emphasis was placed on high-quality materials and a family-friendly design. To emphasize is the location of the house. It is located on the edge of the village, so it is very quiet. 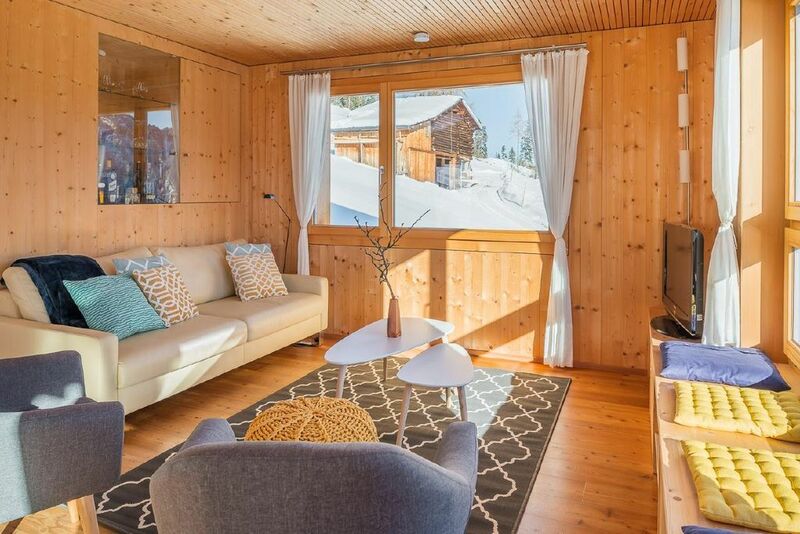 The slightly elevated position overlooks the very well-kept mountain village Tenna and guests can enjoy a magnificent view of the mountains. Well located place for hiking in summer or ski tours in winter. The beautiful terrace with child-friendly equipment ensures privacy. Guests are welcome to visit the nearby Biohof Hofstatt. Guests can get to know the everyday life of the farm or cater for themselves with fine produce from the farm shop. The house is bookable for 4 persons. On request, an additional room for 2 persons can be rented. The rent for the room is apparent under the additional costs. These are settled on the spot. Due to the large windows, the house is very bright. The kitchen is equipped with modern appliances. Refrigerator with freezer, dishwasher, combi steamer and induction hob with four hobs are available. The two bathrooms are very spacious with noble fittings, bathtub and Amazon shower. The living area is very bright. For a cozy stay invite a sofa and two sofa chairs. The stove ensures a particularly cozy atmosphere. The first bedroom with double bed, the second with two single beds. On request, we provide a cot ready. Bedside tables with sockets and bedside lamp. On request, the sauna integrated in the house can be used. Kitchen linen and towels are provided and included in the price. On our farm we have donkeys, suckler cows, cattle, calves, dogs, cats, sheep, chickens and rabbits. The cows and calves are on the alp in summer. - Final cleaning: once per object Costs amounting to 100 CHF (Mandatory). - Sauna: once per object Costs amounting to 100 CHF (optional). - Bed linen: once per person for rent at a price of 15 CHF (Mandatory). - Fuel for chimney/fireplace: per object and day included in price . - Cot for children: per object and day for rent at a price of 10 CHF (optional). - Internet: per object and week Costs amounting to 15 CHF (optional). - Visitor's tax: per person and day Costs amounting to 2.2 CHF (Mandatory). - aditionally room: per person and day Costs amounting to 20 CHF (optional).